Before I start this guide, a caveat for readers… I’m not a local to this location. I have only photographed it once, but really wanted to get this guide up for others. Last year I was on a vacation in Surfers Paradise with my family. I desperately wanted to get away from the high rise blocks and out into some interesting seascape locations. 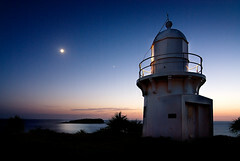 I started communicating with a QLD local called Garry and Garry mentioned he was going to shoot this pretty interesting location called Fingal Head and invited me along. “Pretty interesting Location” is definitely an understatement when it comes to Final Head. This place is one of the most interesting locations I think I have ever photographed. It is also quite technically challenging due to the dark rocks. When you drive up and park your car in the car park, the trail up to the light house is pretty obvious. The lighthouse itself is a gorgeous little light house dating from 1878 and very photogenic. Very nice to photograph in the pre-dawn hours. 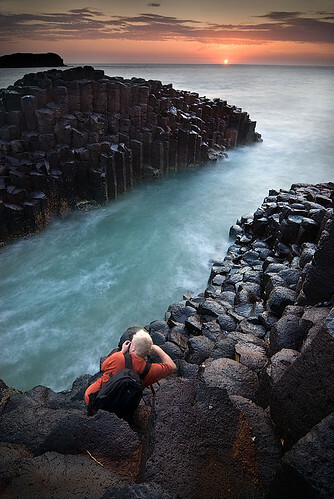 The feature of Fingal Head is the incredible Basalt rock formations. 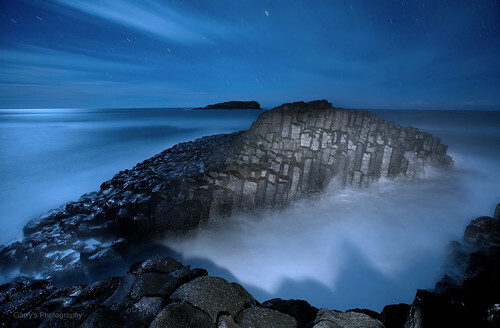 These cooling columns are quite amazing, they are hexagonal rocks of black basalt stacked together like some kind of crazy puzzle. For the geologists out there you can read more about these rocks here. 500 Meters from shore you will see Cook Island. Just in front of the cliff is a smaller island/outcrop. If the surf is low you can cross to the island and often you will see rock fisherman there fishing. There are lots of great shots of Cook Island and the foreground rock formations. There is a lovely little beach with more rounded boulders just to the North (easy rock hop around). The beach is very remote and quiet and if you like shooting more remote beaches, this one is lovely. 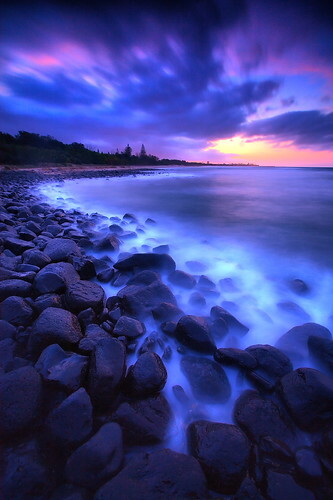 This photo is taken of the rocks on Fingal Beach. You don’t really need any special equipment for Fingal Head, however I would strongly recommend a Grad ND filter as you are shooting due East at Dawn. You should also expect your lens to get covered in salt, so bring a cleaner that you can use to clean your filters or lenses often. If you are shooting down low near the water, just be careful of rogue waves, it would be very easy to be washed off or splashed if a big wave came through. However there is no need to get near the water for great photos… It is a very easy site to move around and photograph. This site is not really impacted by tides, you can shoot it any time unless you are hoping to hop over to the outcrop (not really necessary in my opinion). This location is pretty exposed, so if there is much wind blowing, expect even more spray to coat your gear. Fingal Head is on the North Coast of NSW very close to Tweed Heads, If you are heading South From Brisbane or the Gold Coast, you head down the Pacific Highway until you cross the Chinderah Bay Bridge. From there you take the second exit at the roundabout to Fingal Head Rd and follow it all the way out until you get to the car park by the light house.